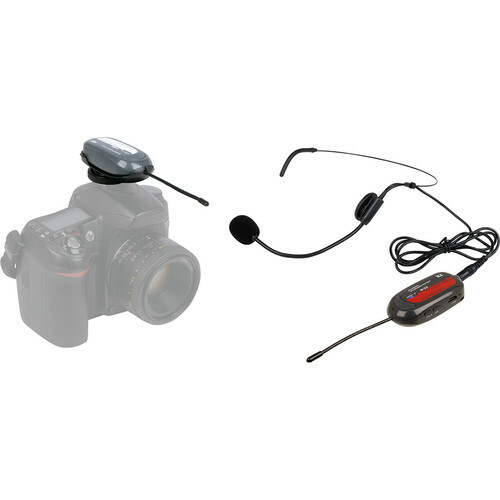 The VocoPro Commander-FILM-HEADSET is a camera-mount digital UHF wireless headset microphone system offering easy operation and fast frequency switching for videographers and sound engineers in conferences, presentations, and houses of worship. It utilizes the 900 MHz band from 915 to 921.5 MHz to avoid interference from TV, radio, and Wi-Fi sources. The system includes a headset microphone equipped with a 3.5mm TS output, a wireless bodypack transmitter, and a wireless camera-mount receiver with a 3.5mm TRS output and a detachable shoe-mount adapter. The Commander-FILM-HEADSET features easy one-button re-syncing for seamlessly changing frequencies if interference is encountered. Internal Li-ion batteries provide hours of run time, and conveniently recharge via USB. LEDs on each transmitter and receiver clearly indicate power and signal status. Volume buttons on the transmitter and receiver allow efficient management of levels throughout the system's signal flow.